This bundle of four back issues – Eye nos. 38, 46, 51 and 69 – encompasses posters that are variously intended for self-promotion, politics, advertising, culture and sheer, self-expressive glee. 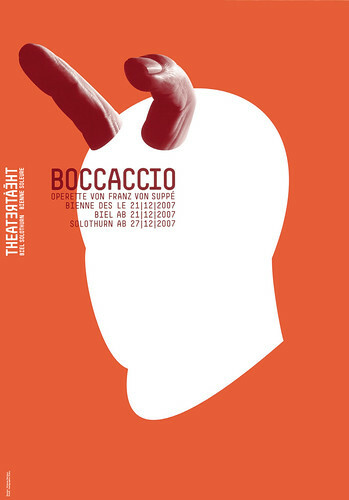 Poster for a production of the operetta Boccaccio by Atelier Bundi, 2007. Top: On and Off the Wall, bargain bundle of Eye back issues. Individual cover design details below. 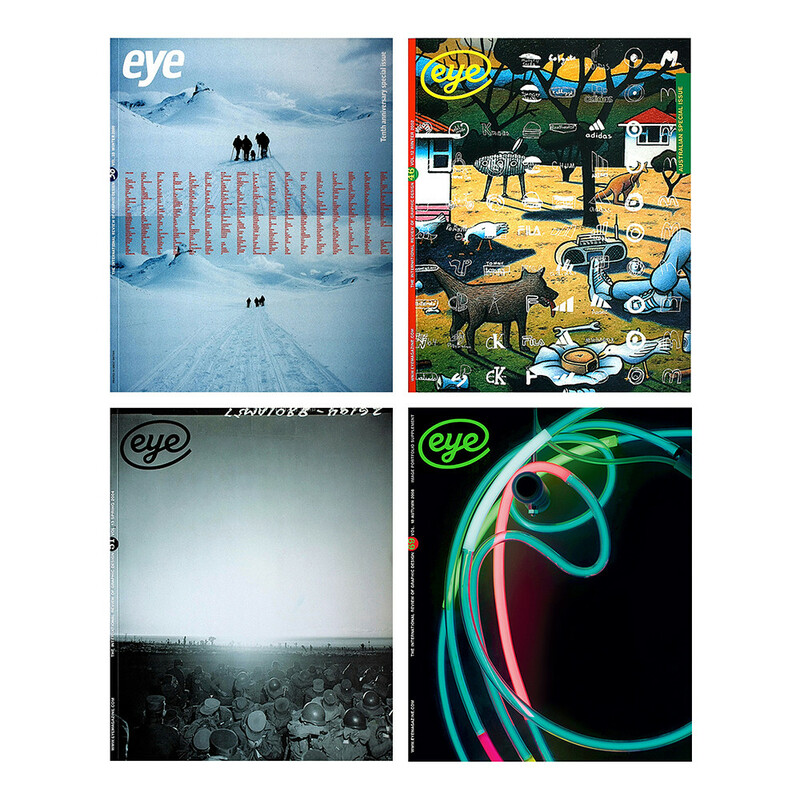 Eye 38, the ‘Tenth anniversary special issue’ had the secondary theme of ‘self-promotion, self-expression’, encompassing work by Pentagram, Experimental Jetset, Browns, Fuel, North, Peter Davenport, artist Richard Hamilton and many more. Cover featuring snapshots by Eye creative director Nick Bell, with overlaid text written in the style of Experimental Jetset. 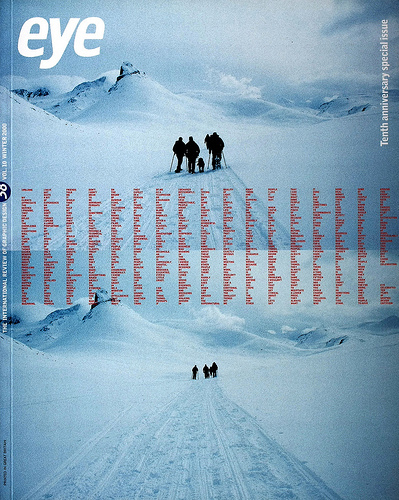 Eye 46 (2002) is the ‘Australian special issue’ guest-edited by Rick Poynor, with features about Mambo, Inkahoots, Douglas Annand and a Reputations interview with Stephen Banham. 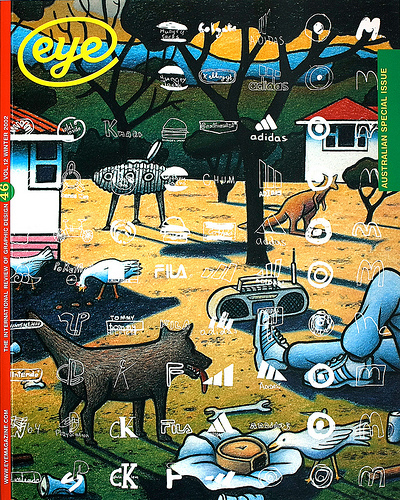 Cover of Eye 46 features a detail from Replacing the Clapped Out Gearbox by Reg Mombassa for Mambo, overprinted by a detail from a poster designed by Stephen Banham. Eye creative director: Nick Bell. 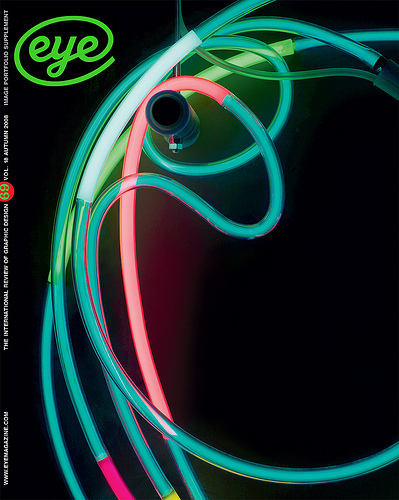 Eye 51 (2004) includes the work of Michael Light, Walter Pamminger, ‘Graphic tourism’ and ‘Land and liberation’, Dana Bartelt’s article about Palestinian posters. 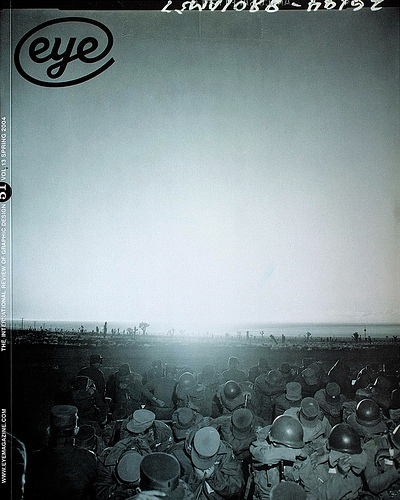 Eye 51 cover shows Stokes, nuclear test, 7 August 1957, by Private Paul W. Hocking, from Michael Light’s book 100 Suns. Eye creative director: Nick Bell. Eye 69 includes Vivien Véronique’s celebrated essay ‘Sticks in the mind’, which compares and contrasts European and North American attitudes to poster design, accompanied by work by Paula Scher, Anette Lenz, Vincent Perrottet, Shepard Fairey, Martin Woodtli, Atelier Bundi and others. 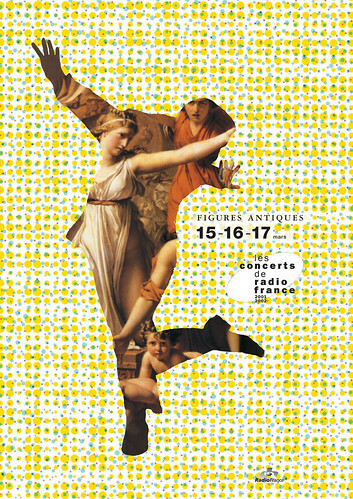 Figures Antiques poster by Anette Lenz, one of a series of ten posters for Radio France, 2001. Also in Eye 69, ‘Awards madness’ by Jason Grant (with ‘infographics’ by Paul Davis) questions the wisdom of entering design competitions, while Alissa Walker’s ‘Mad about awards’ includes some fine (award-winning) posters by Jason Munn and others. Cover shows GTF’s neon sign for Oki-Nami, a Japanese restaurant in Brighton. Photo: Angela Moore. Eye art director: Simon Esterson. You can buy all four issues for the bargain price of £45. There are also four other bundles under the Classic Collections rubric: ‘Back to the 1990s’, ‘Storytelling’, ‘The Big Picture’ and ‘Type and Lettering’.